Enjoying the planets lined up in a row. Read more: More 'bright' fast radio bursts revealed, but where do they all come from? After sunset around Australia, the five bright planets can be seen in the western sky this week. 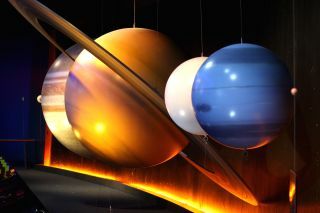 It may seem like a common occurrence, since the five planets have come together again in the space of just a few months. But it's only possible because Jupiter and Saturn are currently on the same side of the Sun and therefore near each other, relatively speaking. The five planets have come together twice this year and twice in 2016, but before that there was a decade when it just wasn't possible. The two gas giants were too far apart. As Jupiter and Saturn pair up in the sky, it's only a matter of time before the other planets fall into the right configuration to bring them all together. So it's still special to spot the five planets coming together. There's great satisfaction in being able to tick off all five planets in a single viewing. Voyager 2 flew by Uranus in 1986 and Neptune in 1989 capturing stunning close-up images. Neptune is about the same size as Uranus but much further away, making it harder to see. Even with a modest telescope it appears as a bluish star, while the right observing conditions and a high-quality telescope are needed to reveal Neptune's disc. Lastly, and not to be left out, even the dwarf planet Pluto joins the crowd. It's much too small and distant to be seen but currently sits about midway between Saturn and Mars. the five bright planets, observed since ancient times, briefly coming together in the western sky.